Of course regular readers will know that I am an avid, long-time runner, so treadmills are a piece of equipment I love to pick apart. In fact I’m currently training for a marathon, so I’m spending plenty of time on various treadmills! Today we are going to be looking at NordicTrack’s T 6.5 S treadmill. This is a great entry level treadmill that could be very useful for beginners to running or fitness in general, similar to other budget treadmills like the Proform 520 ZN However it does have a few limitations which make it of little use to advanced runners. For a more intermediate runner I would recommend something with more speed and incline available, such as the NordicTrack C990. Of course at the top end the cost goes up much more, though if price isn’t an issue and you need top-end performance, something like the LifeSpan TR 3000i is a great way to go. The 3000i gives more speed and an increase in incline ability, plus it has a better console and more extra features. NordicTrack are a very established company who have been creating cardio fitness equipment for decades. They started with skiers in the 1980’s which is how they made it to the big time, and have gone on to expand in to other cardio-fitness areas such as cross-trainers, ellipticals and treadmills. The fold up design makes this excellent for users who have limited space. Simply fold it away when you’re done and you have extra floor space, keeping your room neater and giving more room for other equipment or to move around once done. This feature also makes it a good choice for anybody in cramped living quarters because you can just tuck it neatly against the wall when done, even if it’s in your living room! Folding and un-folding are both made much easier with a hydraulic system too, and it also has wheels to be rolled around easily. Both of these are a plus for a machine that would otherwise be a heavy chore to move around. Also if space is limited for you, check out our best space-saving cardio machines. The deck has a unique cushioning system known as FlexSelect Cushioning. NordicTrack’s trademark cushioning system uses multiple cushions on each side of the treadmill which can be switched on to reduce joint wear. The reduction is stated to be around 33%, great news for anybody suffering joint issues in their legs or even back. You might notice I said ‘switched on’, because this is actually an option and not an always-on setting, which is what lots of other treadmills have. The reason NordicTrack has let you switch this off is that their T 6.5S is also useful for a proper running substitute. If you do want that firm feel of being on the road and building your joints up further, you can switch the cushioning off and run on it in that mode instead. The T 6.5S treadmill comes with 20 workouts as standard, which is already a lot. With these it doesn’t matter what level you’re at or what your goals are, you can always find something that works. Outside of the programs there’s the iFit compatibility as well. If you are an iFit user this gives you endless capabilities. You can literally use the Google maps feature for training routes and simulate any run in the world from your very own home. When it comes to price this is a real good deal for an entry level treadmill. It’s cheap to buy and may not have many bells and whistles but the build quality and sound design are right there. NordicTrack have been around for decades and are a successful name in this market so they have a great record of being highly reliable. With the build quality you get a decent motor and a pretty good weight capacity too. At 300 lbs it isn’t massive but it is able to handle heavier loads than a lot of other budget home treadmills. The standard warranty covers the motor for an impressive 25 years, and the overall frame gets a lifetime guarantee! Parts and labor are limited to a year in the standard warranty. However there are extended warranties available. The NordicTrack T 6.5S treadmill gives you the convenient features that are preferred on a treadmill, though there aren’t really any flashy extras. It can hold your drink and your phone in the cup holders that are provided, and the screen gives a good readout of info. There’s the possibility to tailor it to you by entering metrics such as your height, weight and age as well. Any competitive treadmill these days should have heart sensors (this one does) and the console is also very easy to use. 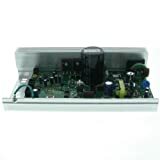 It has is built-in speakers which can be used with any mp3 device of your choice. This is the only extra it has, other than the basic ones. We mentioned as a benefit that this can handle more than the average amount of weight for a home treadmill. This is still a budget model from the NordicTrack range though. Because of that there’s a limit on the incline and it can only be moved upwards. There is no option to set a negative incline. 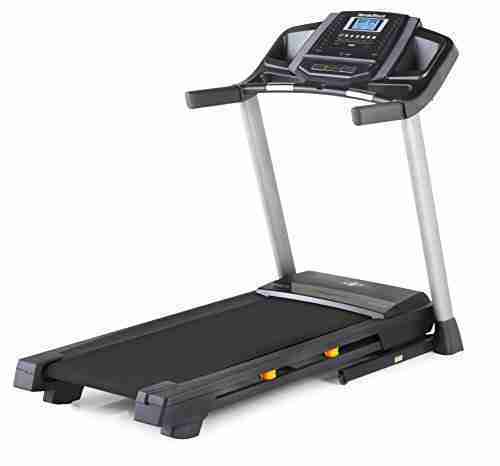 NordicTrack’s T6.5S can move from a flat position up to 10 degrees incline. This is a pretty decent amount for an average workout but if you’re looking to fully simulate a route it limits you from many paths with steeper gradients. It stops you from doing hill sprints and similar interval training too. Limited speed does not help with interval training either. There is a cap of 10mph (16km/h) on the speed setting. This isn’t a full-on sprint for most people. In fact the majority of runners will need a higher speed to hit a sprint. Again this is a limitation which stops it from being useful to many users. Once you gain some decent fitness, you are likely to need more speed. Of course you could always use it as a maintenance/recovery workout sometimes if you do decide to try one. When this gets up to speed the motor begins to get pretty loud. This model has a lot of reliability, which is probably why it isn’t as quiet as some rival motors. Those ones don’t come with a lengthy 25 year warranty though. This one does and seems to pay for it with a bit more noise. The thing is this isn’t a huge problem for most people, because the increase in noise is only slight so while it isn’t ideal, you can just turn the music up a little or even simply ignore it. Oh and also, there are a few steps you can take to reduce treadmill noise if it’s THAT important to you. Like we said earlier there aren’t any real extras here, besides the speakers. The display is informative enough on the basics yet it could do with being bigger so it could display more at the same time. It comes with a console that could also do with being a bit more streamlined too. Also with the NordicTrack T 6.5S there isn’t an onboard fan to help keep you cool nor is there any Bluetooth or wi-fi connectivity, the only ability to play anything through the treadmill is the aux cable connection. This has to be self-assembled when it arrives, though it does come with a little wrench you can use. However this isn’t really a great tool to use and you’re better off having some decent sockets or hex wrenches of your own to use. You’ll also need a phillips screwdriver too. The power cord is pretty short as well so if you’re looking to keep it in a steady location it’s going to need access to a socket nearby. With this NordicTrack treadmill it’s a tough line to draw, because it does have all the basic features that you would need and does a good job of performing well. The adjustable cushioning levels are a great touch too, setting it firmer and combining with the iFit compatibility gives some impressive possibilities. It’s reliable, it looks good and it folds away nice and neat. Yet on the other hand there’s the limited gradient, so you can’t get as much ‘simulation’ as first thought. Then there’s limited speed as well, combining with gradient to limit top-end potential. There can be no hill sprints here unfortunately. Because of that it ultimately can only be recommended for beginners or dedicated walkers. Even the walkers may be wary depending on what they want to do. For anybody else, look for a treadmill that can push you harder such as the NordicTrack C990. Great Information. Looking to purchase this used model and this has helped me decide. We’d love to hear from you and your experience with the product. Enjoy!